Artists and hoarders share an important quality: we love stuff. It gives us a deep sense of rightness, of satisfaction to have this scrap or that bit and to know we will always have access to it. It is very difficult to describe what objects draw us and become necessary. But that gut feeling of connection is a common thread. The difference, however, between hoarders and artists is that very often, artists will actually utilize the things we drag home. Sometimes they become sculpture, sometimes we wear them, sometimes they become still life objects and sometimes we just slap on a coat of paint and call it a day. We understand that these things have purpose. They are living in the sense that they will change over time. They are, very often, intended to change over time; to become worn and comfortable. When you put something in a box or put it away for safekeeping, you deny that “life” by fixing the thing in time and space. So, in a sense, artist are the crazy cat ladies of stuff. We take in all sorts of strays, we feed them, we work with them and we appreciate them for the life they’ve had. We appreciate them for what they are and more importantly, for what they realistically could be; without romance or illusion. Because that is part of our job as artists, to see things as they are. That said, let me introduce you to my latest rescue. An early 60’s era dresser, all wood. Not an ounce of chipboard. Forgive the picture. Our bedroom is dark and the remodeling is ongoing. I spotted this lovely as I was driving through a neighborhood, trying to avoid backed up traffic from a downtown construction project. It was in the midst of a pile of discarded furniture from a rental move-out. There was also a mattress(urine soaked, as it turned out), a couple of flimsy chipboard end-tables and some well loved plastic kids toys. I immediately flipped on my turn indicator to signal the Mister, who was behind me, that we needed to pull over. I made a U-turn (illegally) and pulled up beside his truck window. So he pulled around behind me and we pulled up in front of the house. The family was still taking items out to their car. So I motioned to an older man among them and asked if we could take the dresser. He nodded, so I started to inspect it. It was passable. But I’d need to take it home and take out all the drawers to see if it was worth refinishing. We opened the hatch on the wagon, lowered the middle seats and popped it in. I’d love to tell you that when I picked it up it looked like it looks in the picture. But no. Mud brown shellac. Decals, stickers, reflectors all over the drawer faces. The drawer pulls were original, but bulky and wooden. The drawers were all out of wrack with various splits in the sides from roofing nails being used to try and “repair” it. But beneath all that, the lines were clean. It was well proportioned. The wood was solid and whole. Definitely worth salvaging. 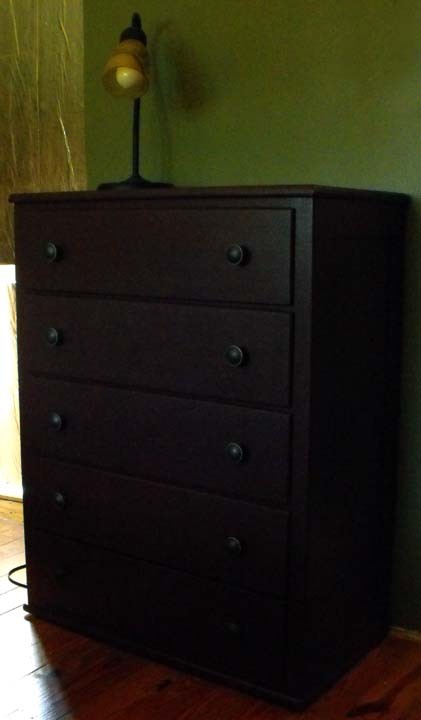 So, I stripped it, glued the splits, repaired the drawers and found a beautiful deep mulberry color to paint it. And while I was buying paint, I found some elegant matte black pulls with a fine copper edging that played off the mulberry very nicely. I did have some issues with the paint and varnish. I liked the flatness of the mulberry paint. But it was going to be prone to scratching and streaking. So I decided to use a satin polyurethane varnish…mostly because it was what I had on hand. I hated the varnish. It was too glossy and since I don’t have a clean room (or a ventilated one for that matter), I was forced to work outside. So the varnish dried too fast and left a textured surface. My solution? Mix the paint and the polyurethane to keep some of the flat of the paint and some of the protection of the polyurethane with a slower drying time to allow for the paint to level. So, yes, I could’ve bought something at Ikea. Something clean and new and frankly, on an artist’s budget, expensive. But this dresser has already had a life, a history. And now, for better or worse, I have become a part of that. A hoarder only wants to see things as they were. An artist sees things as they were and as they potentially could be. It has always been the play, the tension between reality and potential that excites us.